In 1929, John and Helen Murphey created Hacienda Del Sol, a desert oasis and “home away from home” ranch school for “girls only." Inspired by early Moorish architecture, it showcased many details that were crafted by the Murpheys themselves. The prestigious school's roster boasted some of the country’s most elite families: Vanderbilt, Pillsbury, Maxwell, Westinghouse, and Campbell, to name a few. In 1948, Hacienda Del Sol was converted into a guest ranch that immediately attracted the Silver Screen’s most notable stars. Leading men John Wayne and Clark Gable both signed their names to the hotel’s privileged guest book. Today, simple pleasures and understated elegance are found in abundance at this classic Arizona hotel. 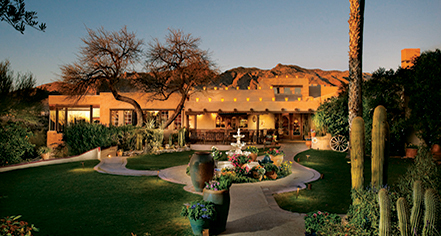 Hacienda Del Sol Guest Ranch Resort, a member of Historic Hotels Worldwide since 2014, dates back to 1929. Legend has it that Casita Grande was the favorite hideaway of Spencer Tracy and Katharine Hepburn. Cancellation Policy: 7 day cancellation. Extra Person Fees: Over two people $10 per person. Hotel/Resort Fees & Taxes: No resort fees. Taxes: 12.05%. Occupancy Restrictions: Varies by room type. The largest room available can accommodate up to eight (8) people. Pet Policy: Service animals allowed: Yes. (Fee exempt) Pets allowed: Yes. In 1929, John and Helen Murphey created Hacienda Del Sol, a desert oasis and “home away from home” ranch school for “girls only." Inspired by early Moorish architecture, it showcased many details that were crafted by the Murpheys themselves. 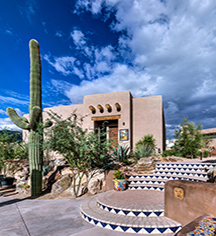 Learn more about the History of Hacienda Del Sol Guest Ranch Resort .